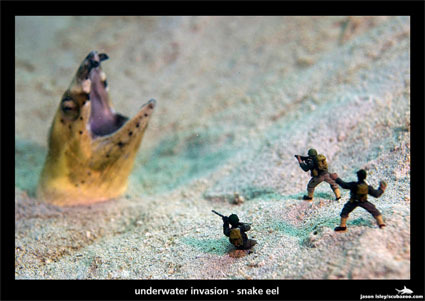 This is a splendid idea, not only as a way to add a unique twist to nature photography, but also as aquarium/vivarium decorations. You’d need to make sure that the figures you used weren’t made of any material that might be toxic to fish, but a burned-out cityscape terrorized by giant hermit crabs or innocent beachgoers being menaced by the Plecostomus of Doom would be way more interesting than a plain ol’ treasure chest. For movies, assuming that you’ve already seen the obvious ones like Poltergeist (still my single favorite horror movie) and The Exorcist (one of the few perks of living in the DC area is being close to the Exorcist steps), let me recommend The Uninvited–the 1944 version, not any of the remakes or similarly-titled dreck–a wonderfully atmospheric ghost story, Constantine (yeah, Keanu Reeves, but also Tilda Swinton), and Alien, still the classic SF/horror hybrid. Oh, and also Blade Runner, just because. Your turn–leave your recommendations in the comments! p.s. – If your comment includes a lot of links, it may be automatically flagged as spam. If that happens, just drop me a line and I’ll fish it out of the spam folder. Video titles don’t lie, you guys. This is, according to the upload description, a “Kenyan species of false-vampire bat,” which I expect makes it a Yellow-winged Bat. This one has a case of the yawns. If you can watch this and not be seized with an overpowering desire to snorgle its tummy, I don’t want to know you. I ran across this photo the other day and thought, “Aw, what a cute thing to do with plastic Easter eggs.” I eventually tracked it back to a Martha Stewart tutorial on making mini treat boxes and discovered that the instructions call for using papier-mache eggs which sell for four bucks a pop. Really, Martha? The price of two of those will buy you a gross of regular ol’ plastic eggs and you can paint ’em any color you want. This tutorial discusses a couple of different methods to get plastic eggs to take paint (and as a bonus, it shows how to make pretty faux-“natural” eggs for decorating). You can paint them all white or do some in cream or light grey for a little more variety. The Martha Stewart instructions use carefully-cut-out crepe paper for the facial features, which strikes me as being entirely too much work. If you want to do it that way, knock yourself out; the suggested glue stick might not adhere too well, so liquid white glue or something like Mod Podge would probably be preferable. A much easier method, to my mind, would be to just cut a paper stencil of the face and paint it on with black paint. Make a bunch–maybe change a few up by painting them orange and giving them Jack-o’-lantern features–and fill them with little treats. Hand them out to friends or hide them and have a particularly gothy egg hunt. They’d also look nice arranged in a basket or even hung like an ornament: To do the latter, either attach ribbon to the wider end with a dab of hot glue, or poke a couple of holes in the end using a dremel tool (or a heated-up nail if you’re careful) and then thread fishing line or yarn through the holes. Giant Glowing Gummy Skull – For all your giant glowing gummy skull needs (although you have to supply the glow yourself). Spiderweb Nail Polish – Tutorial for a lovely spider-and-web manicure. The same site has quite a few other spooky nail art too. Pulp-o-Mizer – Really well-done image manipulator that lets you create your own pulp magazine cover. Bat Orphans – A look at bat rescue efforts in Australia. The cute, I am dying of it. Horrorgami – Book of spooky origami projects. In the same vein (har!) there’s Monster Origami and Zombigami. Giant Glow-in-the-Dark Googly Eyes – Yet another way to add eyeballs to the landscape. 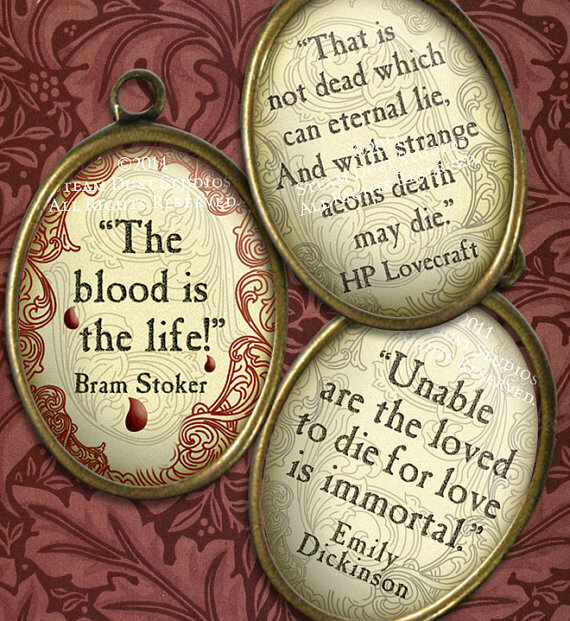 I recently stumbled across a photo of what appeared to be antique-looking brooches featuring gothic quotations, but eventually tracked them down to an Etsy shop and found that what was actually being sold were digital collage sheets and the photo was just a suggested use for them. Fortunately, such brooches–and other jewelry–would be ridiculously simple to DIY. All you need are brooch findings (also called brooch bases and brooch blanks and if you search for “brooch” long enough it stops looking like a word any more), some kind of image-manipulation software, and a color printer. The bases are easy enough to locate; they can be found in the jewelry-making section of most craft stores, or online: Places like Fire Mountain Gems have pin backs and pendants and even button covers if you want to use short quotes and write teeny. These photo brooches are nice, and you can also finds loads of different styles on Etsy, like this one. Make sure the image will fit your jewelry finding, print it out, and cut it to shape. Glue in place, and if you aren’t using a finding with a cover, give it a couple of coats of a clear sealer like Mod Podge to protect it. Easy! Cheap! A fun gift idea, and also a good project to do with kids. 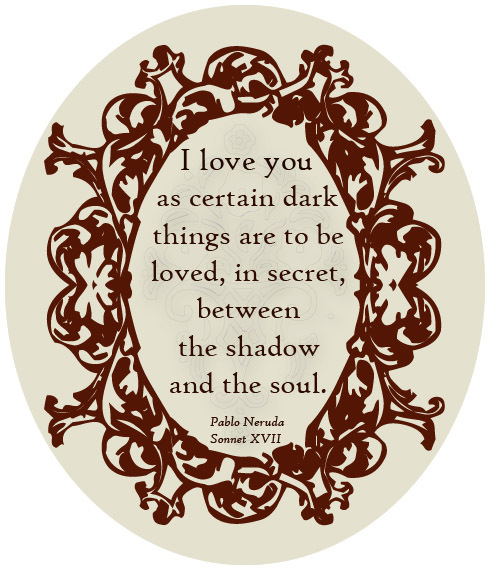 A bunch of these with different quotations would look good arranged on a purse or jacket. This entire list is courtesy of Twitter user rolldiggity, who has some splendid ideas about sowing a little chaos. 1. Fill a calendar with the names and dates of recent local murders. 2. Add several future names. 3. Leave it on the work photocopier. Fun Game: Drive up to a park in a windowless van, jump out the back wearing a mask, aggressively pick a handful of flowers, and drive away. A good conversation starter is to fill your coat closet with claw-torn shirts and pants labeled “Full moon clothes”. Fun camping game: Stand in a clearing, and wait for people to catch you in the act of throwing a wheelchair and tiny backpack in the river. 1. Sit in stall of crowded bathroom. 2. Shout into phone, “Bring the money or the children are dead!” 3. Exit stall and make small talk. Fun Game: 1. Stand in middle of packed elevator. 2. Murmur, “Please… not here…” 3. Begin shaking live mice out of pant legs. Seeing how many weeks in a row the grocery store will make me a “Sorry I Killed Your Dog” cake before they call the police. Fun Game: 1. Walk into Porta Potty with small dog. 2. Hide dog in your backpack. 3. Walk out empty handed, whistling and twirling leash. Waiting to see how long it takes the library to notice all the books I’m returning have “HELP ME” written in blood on the inside cover. 1. Sit down next to stranger on park bench. 2. Place an envelope beside him. 3. Whisper, “It has to look like an accident.” 4. Walk away. I had to buy 20 different Golden Retrievers last month, but it was worth it to make my neighbor think his dog was turning back into a puppy. This. Sounds like fun. It also sounds like the kind of thing that Amazon (or the like) needs to enable for ebooks. I have a bunch of books that I think it would be fun to spring upon you and your unsuspecting readers you and your readers might enjoy, but since they’re not physical, it’s harder to share them. Well, we may not be able to share them, but we can at least recommend ’em. I’ll go first. Song of Kali – An American journalist travels to Calcutta and encounters a horrific cult which worships Kali. Carrion Comfort – Multiple timelines weave together a story of “mind vampires” who can use their powers to completely control anyone. Drood – Fictionalized account of the last few years of Charles Dickens’ life, explaining why his final novel remained unfinished. Prayers to Broken Stones – A great collection of short stories, covering topics as diverse as the familial implications of returning from the dead, a combat theme park in Vietnam, and a barber’s guild with a dark secret. Summer of Night – A Stephen King-esque tale of five pre-teen protagonists who discover something terrifying in an old school building. Its sequel, A Winter Haunting, finds one of them as an adult encountering something that was left behind. The Terror – Fictionalized account of the HMS Erebus and HMS Terror, a lost Arctic expedition. Now it’s your turn: What books do you think other readers of this site might enjoy? Leave your suggestions in the comments! Lady of Orda Cave – Free-diving champion Natalia Avseenko ventured into the underwater Ordynskaya Cave in Perm, Russia dressed as the Lady of the Cave, a spirit claimed to protect divers. The photos are ethereal and spooky. Monster Chairs – Probably not terribly comfortable, but undeniably awesome-looking. Loch Ness Glamping – Now you can search for cryptids from the comfort of a swanky cabin. Lore Brand Comics – He does have a valid point. Vampire Reborn Babies – “Reborns” are extremely realistic dolls which look like babies or small children. Some owners have started adding fangs. They’re sort of adorable. Zombies Hate Stuff – Amusing book detailing the many things zombies hate. Oddly, they’re okay with Canadians. Beware the Moon – Gorgeous bronze skull wallpaper, if you’ve got a few extra hundred bucks laying around. dogzillalives – deviantART user who specializes in hideous sculpted light switchplates, jewelry, and other oddities. The stitched eyes cuff is particularly repellent. She also has an Etsy shop.